GREENGUARDGold certified. Safety first! We've built up to 300% more tip-resistance into these units. 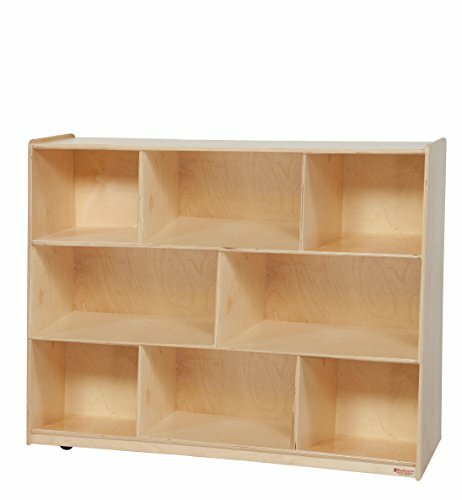 16"W base increases shelf space with sections for storing books, puzzles, games & more. Our exclusive Tip-Me-Not design provides a safer environment for everyone in your classroom. 100% Healthy Kids Plywood with our exclusive Tuff-Gloss UV finish. On heavy-duty easy rolling casters for mobility. 36"H x 48"W x 16"D.
Tip-Me-Not (8) section, 36"H, storage unit with heavy-duty casters. All surfaces and back are constructed entirely from Healthy Kids plywood. Up to 300 Percentage more tip resistant than traditional furniture mounted on Heavy Duty Swivel Casters for Mobility. Promotes a healthier early learning environment. Does not emit any harmful contaminants (VOCs) into atmosphere. Product Dimensions: 36"Hx48"Wx16"D. Product Weight: 80 lbs.